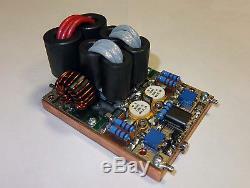 HF power amplifier 1.8-54 MHz Input power 5W Output power 800W (CW/SSB). Current max 30A Transistors - SD2943 2 pcs Size - 100 x 75 x 55(h) mm Weight - 1.030 kg Video test see youtube. The item "Power amplifier 1.8-54 MHz 800W CWithSSB MOSFET SD2943 scheme as VRF2933 or LDMOS" is in sale since Friday, November 24, 2017. This item is in the category "Consumer Electronics\Radio Communication\Ham, Amateur Radio\Ham Radio Amplifiers". The seller is "v_r3kr" and is located in Voronezh. This item can be shipped worldwide.